The Dublin government has published draft legislation on its plans to spend almost a hundred billion Euro to purchase property assets at inflated prices from banks, builders and developers. Sinn Fein finance spokesman Arthur Morgan said the government and the banks were perpetrating the “crime of the century”. While the pricing of the assets is unlikely to be revealed in the short term, it is known that almost all of the assets will be purchased at prices well above current market value. Extensive and historic powers to acquire development loans from banks were given to the new government agency under the terms of the draft Bill published yesterday evening. The government has denied the plan amounts to a bail-out of greedy bankers and developers, many of whom are known to be friends and supporters of Fianna Fail. But it has admitted it is keen to avoid a real estate ‘fire sale’ which could further deflate Ireland’s massive property bubble. With the Irish property market largely frozen by the economic collapse, analysts have expressed widely differing views as to the value of the ubiquitous new developments, many of which remain incomplete or are falling into disrepair. Many developers have also suffered heavy losses on speculation in the international property market, and these assets are also to be purchased by the taxpayer under the scheme, also for unknown prices. Minister for Finance Brian Lenihan insisted the agency would not be paying “bubble property prices” to the banks for the loans and claimed that in the long term NAMA would be able to operate on a break-even basis. The Minister said that an overall figure for loans would be announced in mid-September when the Bill comes before the Dail. However, the estimated cost to the taxpayer is expected to be some 20 to 30 billion Euro. HMr Lenihan claimed NAMA would not be used to benefit property developers or banks, who he said had taken the “first hit”. “If you look at the historic value of the properties secured by all these loans, then clearly if you take them at a peak in 2006, there’s been a considerable reduction in their value since...the whole nature of this operation is that it is the developer and the bank that takes the first hit, not the taxpayer,” he said. The property market bail-out comes amid swingeing cutbacks across the economy, which last week saw the bitterly-fought termination of hospital services in Monaghan and Sligo. 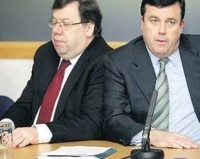 However, Mr Lenihan has bizarrely insisted that the banking crisis is “entirely separate” to the financial crisis affecting the country. He criticised opposition parties and union leaders for even suggesting that this was the case. Fine Gael deputy leader and finance spokesman Richard Bruton said the coalition government was asking the taxpayers for an enormous blank cheque. “The central concern with NAMA has been the worry that taxpayers will be asked to pay too much for these toxic loans,” said Mr Bruton who added that it provided a very elastic concept of “long-term value” for valuing the impaired bank loans and gave the Minister very substantial powers as to how this will be estimated. Mr Bruton said there was a very real prospect that in a few years’ time, these same individuals would pop up again to buy the assets at an enormous discount, funded by the same banks whose liquidity problems were now being eased. “This legislation represents an enormous gamble by the Fianna Fail Government on bankers, developers and the future of the Irish property market,” he said. Labour Party front bencher and former minister for finance Ruairi Quinn said that Fianna Fail was proposing to establish the biggest property company in the world and asking taxpayers to foot the bill and bear all the risk. Sinn Fein finance spokesman Arthur Morgan accused the Dublin government and the banks of perpetrating “the crime of the century”, saying they had burdened generations with unprecedented debt and crippled the public finances “for who knows how long”. “Every euro of the 10 billion already pumped into Anglo, AIB and Bank of Ireland on top of the astronomical cost of NAMA is a euro being taken out of vital public services such as education, health, job creation and the delivery of critical infrastructure,” said the Louth representative. “And the weight of debt on future generations is as yet immeasurable. “Fianna Fail, the banks and property developers are responsible for Ireland’s economic crash, as is the Green Party for its refusal to reign in its government partners, and indeed the party’s role in burdening generations with unprecedented debt and crippling our public finances for who knows how long. Sinn Fein is to hold a national day of action against the NAMA bailout. “We will be campaigning in our communities throughout the country for greater investment in education, health, job creation and critical infrastructure and an end to the Fianna Fail cronyism once and for all,” said Mr Morgan.